How Much Does Netflix Pay Its TV Actors? The salaries of movie and TV stars isn't often a matter of public record, although when some actors pull in a record pay-day, it's often reported. Netflix is still a fairly new presence in the TV environment, but it seems they are paying some of their stars quite well, after just a few years of churning out a slew of original programs. A new survey was released today that revealed the highest salaries per-episodes for dramatic and comedic stars, and the streaming service has a major presence in both categories, with three out of the top 5 highest salaries in the drama category. The survey was conducted by Variety, who spoke with actors, executives, attorneys, agents, managers, and other representatives to try and capture a "snapshot of the earnings power" of talent at all levels in all facets of TV programming, including primetime, late-night, daytime, and news. 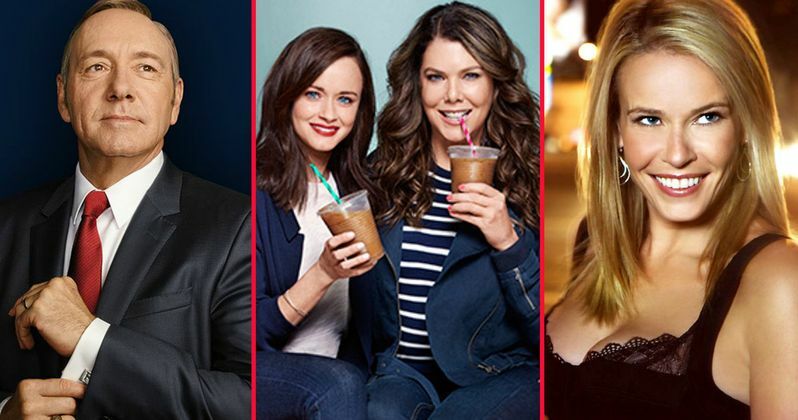 On the drama side, Gilmore Girls stars Lauren Graham and Alexis Bledel came out on top with a whopping $750,000 per-episode, followed by NCIS star Mark Harmon with $525,000 per-episode and Netflix's House of Cards star Kevin Spacey tied with four Game of Thrones stars (Peter Dinklage, Lena Headey, Kit Harington and Emilia Clarke), all of whom make $500,000 per episode. However, since the upcoming Gilmore Girls: A Year in the Life revival only spans four feature-length episodes, that means both Lauren Graham and Alexis Bledel will earn $3 million apiece for this final season. Mark Harmon, whose series NCIS typically airs 24 episodes a season, will earn $12.6 million this season, Kevin Spacey will earn $6.5 million for a 13-episode season of House of Cards and all the Game of Thrones stars will take home $5 million for their 10-episode season. Netflix was also represented on the drama side by Joel Kinnaman, who will earn $350,000 per episode from the upcoming series Altered Carbon, while Naomi Watts will take home $275,000 per episode for the streaming service's upcoming Gypsy. On the comedy side, CBS' The Big Bang Theory's big three, Jim Parsons, Kaley Cuoco and Johnny Galecki all earn $1 million per episode, and the only actor who is close to that figure is Dwayne Johnson, who earns $400,000 per episode from HBO's hit show Ballers. Netflix represents the next three names on the list, though, with Drew Barrymore earning $350,000 per-episode for the upcoming Santa Clarita Diet, with both Emma Stone and Jonah Hill taking home the same amount for each episode of their new series Maniac. This survey also reveals that Netflix is paying comedian Chelsea Handler $10 million for her new series Chelea. None of these aforementioned stars can even come close to the top TV earner on this list, Judge Judy Sheindlin, who earns a whopping $47 million per year through her syndicated TV series. This survey also reveals that pop star Miley Cyrus is making somewhere between $13 million and $15 million for her work on NBC's The Voice this season. You can visit Variety to take a look at the full survey, and to see how much your other favorite TV stars are earning per episodes.